It’s tailgating season again and this year I wanted to combine two of my favorite foods into an easy to eat pre-game treat. 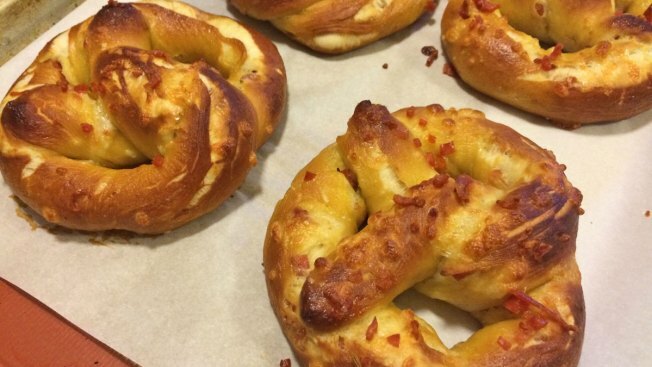 I took the flavors from my favorite pizza, pepperoni and cheese, and combine it with a soft pretzel. And, I made a marinara dipping sauce to bring all the flavors together. This is a great make ahead dish that can be wrapped in aluminum and reheated on a grill for the pre-game party. Mix yeast, brown sugar and 2 tablespoons of flour in a medium sized bowl. Gradually stir in 3/4 cup of warm water. Combine thoroughly and let set for 10 minutes as yeast activates. Finely chop the pepperoni and chop the shredded mozzarella into smaller pieces and set them both aside. Separately, mix 4 1/2 cups of flour, 1 tablespoon of kosher salt and the 1 tablespoons of dry mustard in a large bowl (or mixing bowl of a stand mixer). Melt 4 tablespoons of butter and add to the mixture along with the remaining 1 cup of warm water. Stir to moisten ingredients. Add the yeast mixture and work the mixture to form a dough. Knead the dough for about 10 minutes on a work surface (or, if using a stand mixer, use the dough hook at medium low speed for 5 minutes) working in additional dough if necessary (up to 1/2 cup) until it’s elastic but no longer sticky. Work about 3/4 of the pepperoni and 3/4 of the mozzarella into the dough until fully incorporated. You’ll use the remainder to top the pretzels. Rub the remaining 1 tablespoon of butter on the bottom and sides of a large bowl. Turn the dough into the bowl butter all sides. Cover with a towel and let rise for about an hour. Meanwhile, bring 5 quarts of water to a boil in a large stockpot. Slowly add the 1/2 cup of baking soda in very small amounts (the water will bubble up with each addition so be careful). Flatten dough slightly and divide into 10 equal portions. Cover portions not being used. With each portion, roll into a 2' long rope. Holding both ends, form a long "U" shape on your work surface. Overlap the ends two times and then lift the ends up and onto the top of the "U" to form a pretzel shape. Work the shape a bit until it has a uniform look to it. Put a dab of water under the ends of the pretzels where they tough the top of the "U" to help them stay in place. Using a large slotted spoon, gently place one pretzel into the boiling water. Within 30 seconds it should be floating on top. Remove from the water after about 45 seconds total and place on the wire rack. Repeat with remaining pretzels and be sure to stir the water occasionally so that baking soda is fully blended. Brush each pretzel with a liberal amount of beaten egg. Sprinkle the remaining cheese and pepperoni on top. Gently transfer pretzels to a baking sheet lined with parchment or a silicon baking pad. Bake for 15-18 minutes or until deep golden brown. Remove from oven and allow to cool. Serve pretzels with marinara sauce. For tailgating, place pretzels in a large aluminum container and cover with aluminum foil. The entire container can be place on a grill away from the heat source to warm up the pretzels. Put olive oil and shallots in a medium saucepan over medium low heat. Sauté, stirring often for about 4 minutes. Add garlic and stir for another 2 minutes. Add oregano, tomato sauce and salt and stir to combine. Increase heat to medium high and sauté for an additional 10 minutes allowing sauce to reduce and thicken a bit. Transfer to a serving bowl and serve. For tailgating, prepare ahead and transfer to a disposable aluminum pan and cover with aluminum foil. Simple reheat the container on a grill before serving.